Security forces in Sudan fired tear gas at protesters in an attempt to break up a demonstration in frnt of the defence ministry in central Khartoum, witnesses said on Monday. A witness told Al Jazeera that security forces on pickup trucks fired the gas as they charged towards the protesters who have been calling for the resignation of President Omar al-Bashir amid deepening economic woes. “After that, security forces began firing tear gas at protesters,” the witness said. Other witnesses told AFP news agency that the army deployed troops around its headquarters in the capital and blocked several roads leading to the complex, where protesters have amassed since Saturday. The tear gas fired on Monday morning was felt by residents in an upscale Khartoum district some five kilometres away from the army complex. 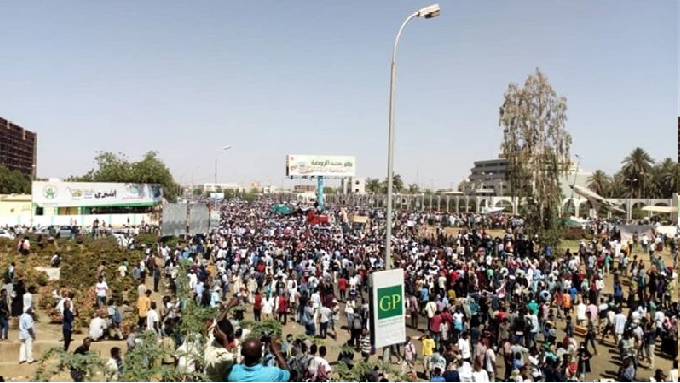 Thousands of people have rallied outside the headquarters of the Sudanese army in Khartoum since Saturday, urging the country’s military to back their demands for Bashir’s resignation. Protest organisers chose April 6 to begin the rally outside the army headquarters to mark the 1985 uprising that toppled the administration of then-President Jaafar Nimeiri. The military removed Nimeiri before handing power to an elected government, which in turn was overthrown by al-Bashir in a 1989 coup. Bashir, meanwhile, has refused to step down, saying that his opponents need to seek power through the ballot box. Since April 6, at least four people have been killedby security forces in Khartoum.